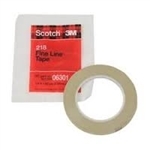 3M 3/4" Yellow Automotive Refinish Masking Tape Designed to meet today's paint technicians requirements for masking before painting; no adhesive transfer; no edge lifting; waterborne paint system compatible. 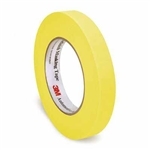 3M 1 1/2" Yellow Automotive Refinish Masking Tape Designed to meet today's paint technicians requirements for masking before painting; no adhesive transfer; no edge lifting; waterbourne system compatible. $5.15 each roll, $30.93 per sleeve of 6 rolls, $123.72 per case of 24 rolls. Paintable overspray protection. 10 mm wide hard band designed to actually lift up the molding from the vehicle, allowing paint to flow under the molding. 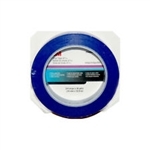 This tape works particularly well on flush mount windshield and back glass moldings. With Norton Blue Sheeting, paint will adhere to the outside layer of plastic, eliminating paint flake-off, allowing for direct spray. Blue Sheeting features an easy-to-open fold pattern. All sizes come on a standard core to fit all current plastic masking dispensers, so one person can mask the vehicle alone. The cling of Blue Sheeting ensures the material adheres to the area that is to be protected. Blue Sheeting can be cut and painted along the critical edge, replacing paper in the shops. This tri-layer plastic is .4 mil thick. EzEdger is a patented masking tape dispenser designed to help auto body painters achieve smooth blended finish. EzEdger automatically folds under one edge of any 3/4" tape as the tape is dispensed. This rounded edge helps to disperse the paint during a spray and allows smooth transitional finish. No more hard tape lines.